There has thankfully been a resurgence in the traditional manly barber and shave shops in the last decade or so. Traditional shave shops and barbers have emerged to start providing straight razor shaves to men who feel they need to be pampered just like the women. In many cases, these hot shaves include an large dose of the right shaving cream, a very hot pampering towel and a straight razor or shavette (complete with a single edge razor blade) for getting a better shave than you can even get at home. The rise of the bearded gentleman has also had an impact on this phenomenon. Instead of using a typical cartridge, straight or safety razor to do the work directly, many a masculine bearded gentleman is headed into the barber shop much less frequently to pay for the hot-towel pampering and facial-exfoliating experience of a traditional wet shave. This increase in foot traffic to more urban barber shops is greatly increasing the opportunity for successful barbers to implement digital signage of their own. This wet shave experience is often supplemented and complemented with television. Shows men love like ESPN are on a continuous loop while the barber takes his time preparing, cutting, shaving and otherwise trimming the faces of his clientele. Invite patrons discount if they refer friends. However, most barber shop or shave parlor business owners are too busy to take the time to publish content on their own screens. 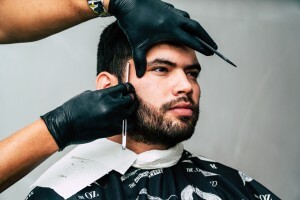 In fact, in most cases, they simply lack the skills required to make, schedule and regularly update digital signage content in their barber shop. That’s why we created our content design team. They work directly with business owners like you to get you set up with all the right content–not only for your digital signage screen’s debut, but also for it’s long-term sustainability as a way to drive more traffic, leads and sales to your barber shop. Running a small business is not an easy task. Sometimes it requires complete focus on what you are best at. For the barber or wet shaver, that usually means hair reduction, not digital signage screens. That’s why we’re here. Give us a call. We would love to assist on the rollout of your digital screen network for your barber shop(s).